Our award-winning Infinity air purifier doesn't just filter air: Its Captures and Kills™ technology is unforgiving when it comes to airborne pathogens such as bacteria, viruses and mold. Grizzly? Yes — if you're a mold spore. 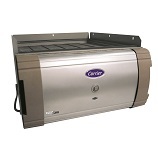 This whole-house air cleaner also re-purifies circulated indoor air as many as 8 times an hour. Those poor pathogens don't stand a chance. If clean air matters to you, this system may be just what you're looking for. It's the little brother to the Infinity® air purifier designed to be more budget conscious and to fit narrower installation spaces. It also uses Captures & Kills™ technology to continuously filter out pollutants, allergens and pathogens in your home, to leave you with cleaner, healthier air.